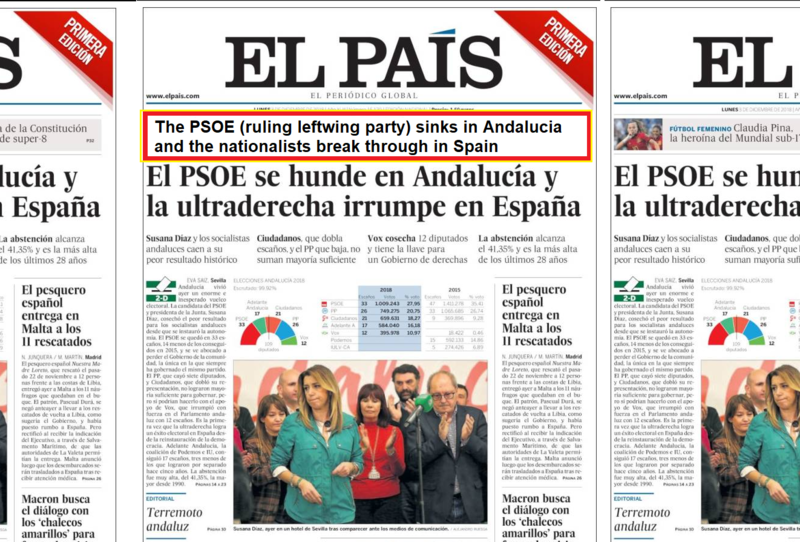 Today’s front page of Spain’s biggest newspaper El Pais (the country) shows a less than enthusiastic ruling Socialist Party after the government was unable to stop the nationalist anti-immigration party Vox who were the clear big winners of the night. Even though the more traditional media had forecasted that Vox would take 3 to maximum 5 percent of the votes, the anti-immigration party were the biggest winners of the evening and took 11%, meaning that they gained 12 seats in the regional parliament and send a stark warning to the minority government of leftwing Prime Minister Pedro Sanchez that he will have to change course in matters of immigration or face a similar result in national elections soon. Vox could be a kingmaker in a coalition in Andalusia and hand regional power to the centre-right parties. The breakthrough is the latest in a nationalist surge that has swept across Europe ever since the Brexit vote in 2015. Far-right to enter Spain's regional parliament. The populist Vox party will enter the government in Andalucia. It is the first time a far-right party will enter a parliament for the first time in decades. Many had assumed Spain would remain immune because of memories of life under the fascist dictatorship of General Franco (which only ended in 1980), but the recent arrival of record numbers of African immigrants (after Italy shut down its ports as soon as populist Mr Matteo Salvini was elected and took on the role as Interior Minister), has seen a rise in anti-immigration sentiment and more rightwing voting. As the traditional conservative party PP was caught in a corruption scandal, many choose to go with the nationalists instead. France's rightwing leader Marine Le Pen congratulated her southern neighbors immediately: "Strong and warm congratulations to my friends from Vox, who tonight in Spain scored a meaningful result for such a young and dynamic movement." For the most southern province in Spain, Andalucia, it could mean the end of an era as the Socialist Party has ruled the region for 36 years. It still won more than any other party, 33 seats, but like everywhere else in Europe say its vote tally slumped to unseen lows. Related coverage: Spain – 560 Migrants Arrive In 1 Night, Populist Parties Soar In Polls. The Socialists are not left with enough votes for a majority even with potential leftwing allies. Furthermore, if Vox is able to take 11% in a province where it was forecasted to win 3% (see our related coverage) then the other Spanish regions should fare even better for them. The latest result will send shivers down the spines of European officials who fear a rightwing wave could sweep over the EU Parliament in next year’s May election as well. Even in Ireland now we have 2 new parties willing to push back. Renua and the Irexit party.